With my time in South Korea complete, it was time to head back home. I had managed to get myself a nice long layover in Tokyo so I could have a day in the city. First, I needed to fly there from Seoul. My flight was from Seoul’s smaller Gimpo airport to Tokyo Haneda on Japan Airlines. 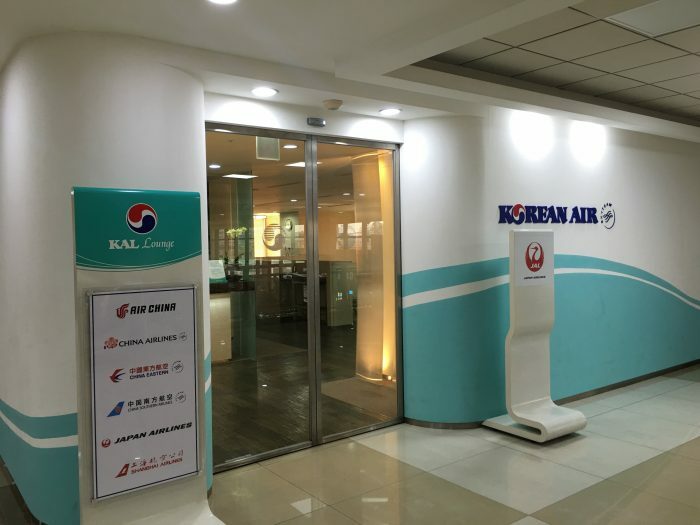 JAL shares a lounge at Gimpo with Korean Airlines, so before my flight I visited the KAL Lounge Seoul Gimpo. 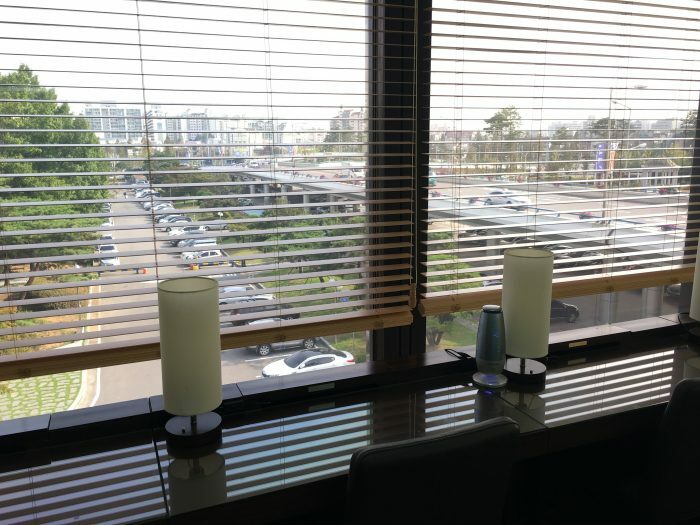 The KAL Lounge Seoul Gimpo is landside, which is not optimal, however, given that Gimpo is pretty quiet, the security lines are short. The lounge is just upstairs after checkin, on the right. 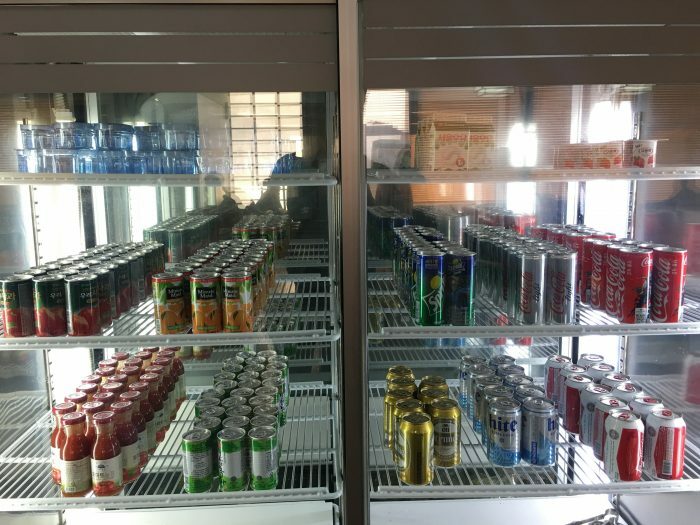 When I arrived in the KAL Lounge, it was nearly empty. There were plenty of seats available, though they were somewhat crammed together, and also all facing the same direction as if the room itself was going to be moving in that direction. 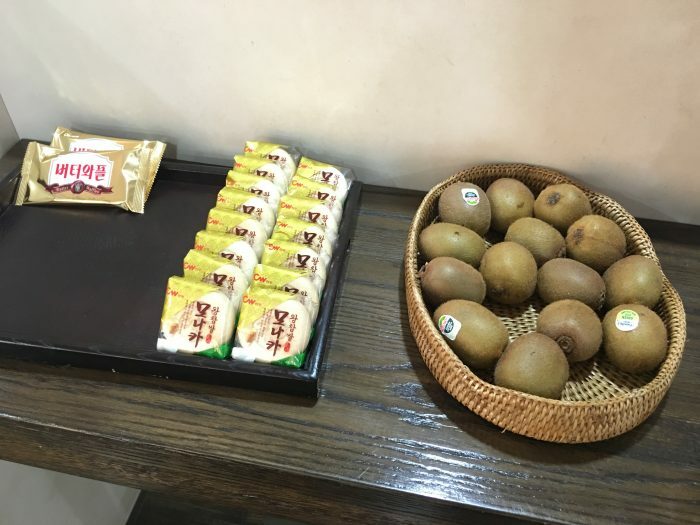 The food was standard cold snacks, though it was a somewhat eclectic selection. The nearby Grand Hyatt is apparently responsible for the catering. 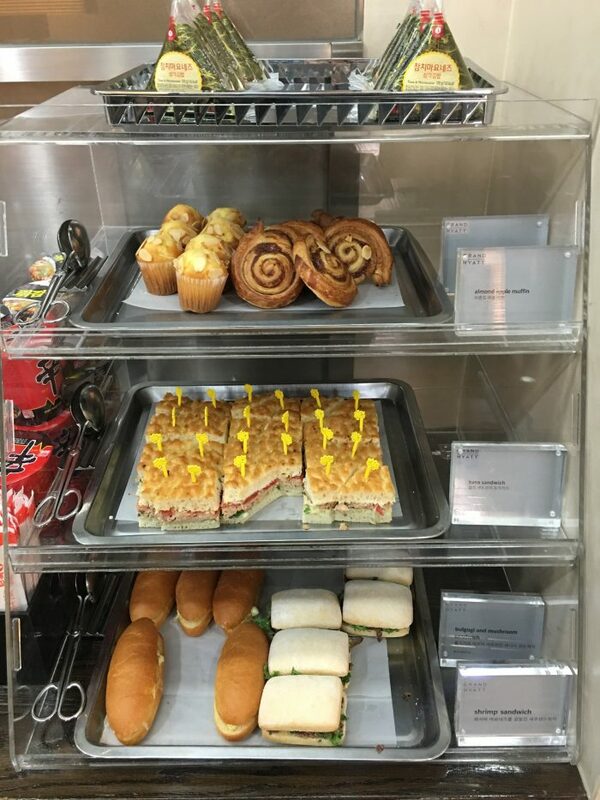 There was gouda cheese, chocolate apricot cake, some small sandwiches, noodles, and kiwis. The alcohol selection was almost non-existent. There were only 3 different liquors available, plus a couple of bottles of wine. It was only 10am, so perhaps more is available later. 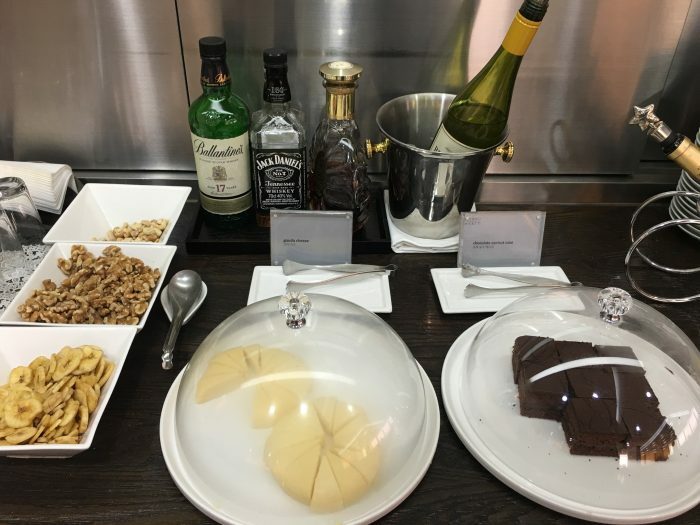 However, I’ve found that most lounges don’t tend to change their drink selection based on the time. There was also a basic coffee machine. Back to the lounge itself, it was decently bright. There was also a view of the city, which is different for an airport. Normally you either see nothing, or you see a large sprawling airport. There was a counter available as a workspace, but there were no computers. There were also a couple of TVs. 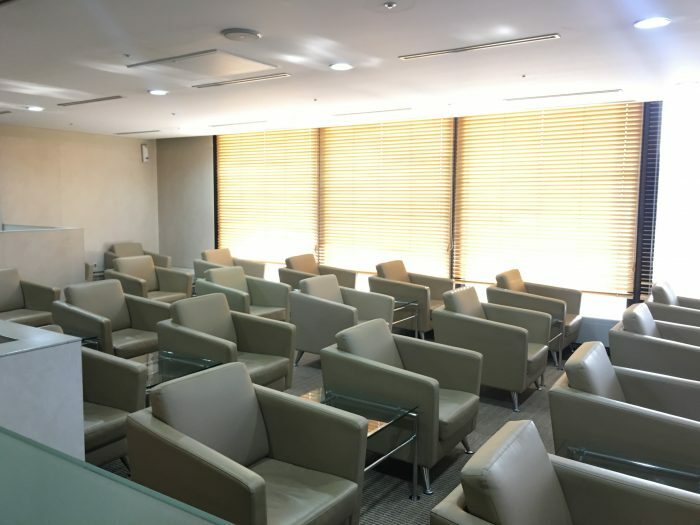 The KAL Lounge Seoul Gimpo is a very basic airport lounge. Although there weren’t many amenities, the lounge itself was a fairly pleasant place to hang out, thanks to how quiet it was. 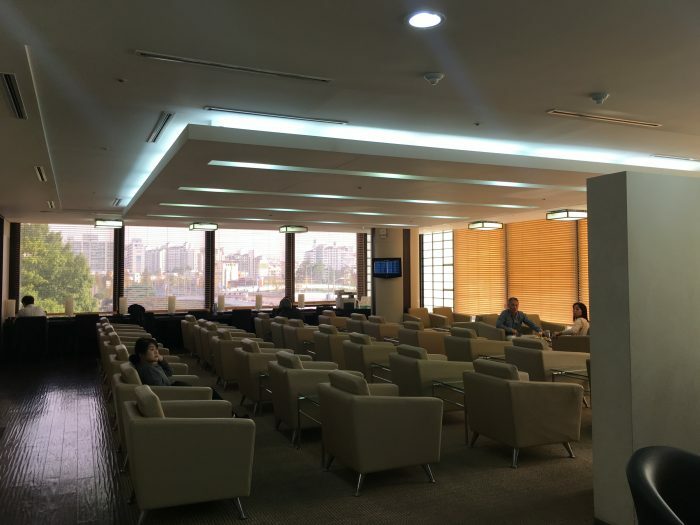 I stayed there for about 30 minutes, then went to check out the terminal’s other lounge, the Air Lounge Hue Seoul Gimpo.